Delhi Traffic Police which had been testing the e-Challan system since some time has now started rolling out the handheld devices which enable the vehicle owners with pending traffic penalties to pay these challans. These devices have been introduced at 20 places in the city and will allow you to clear the pending traffic challan by making payment through either Debit Card or Credit Card. 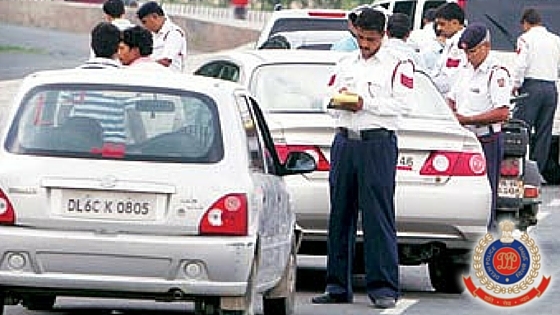 e Challan is a facility which Delhi Traffic Police has been testing for a lot of time. It allows traffic enforcement through non contact by raising traffic fines against vehicles whose traffic violation is captured by the cameras. There are over 1200 traffic cops in Delhi who have been provided with these e challan handheld devices to raise e-challans. You can check pending e-challans against your vehicle by visiting the following site of Delhi Traffic Police. If you have a pending e-challan which you find in the above link then now you can make payment of this traffic challan by visiting any of these areas and finding a traffic officer having a handheld device. This facility is available at 20 locations for payment of e-challan some of which are Dwarka, RK Puram, Vasant Vihar, Hauz Khas, Greater Kailash, Punjabi Bagh, Kalyanpuri, Ashok Vihar and others. As per the Delhi Traffic Commissioner this facility of e-payment will be implemented all over Delhi in couple of months. Besides the above option, citizens can also pay there pending e-challan via Internet Banking as described below step by step. 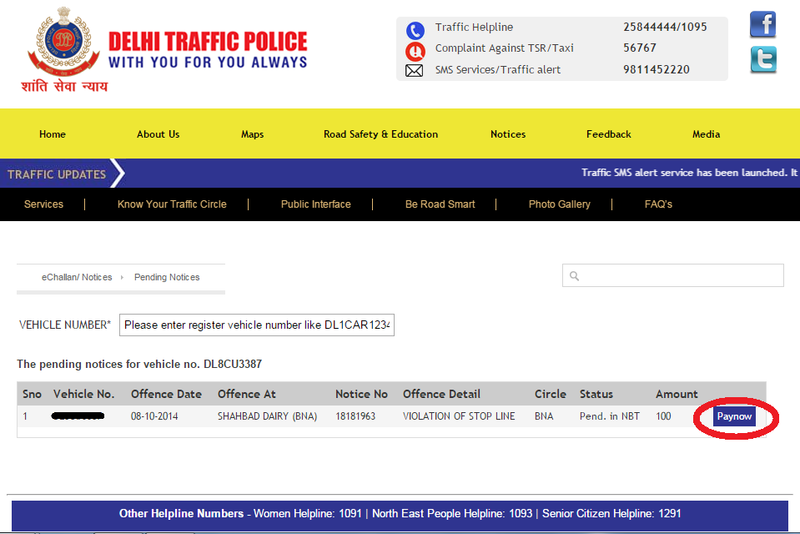 Once you open the above link enter your vehicle number and the e-challan will be displayed as shown in the image below. Click on Pay Now as circled above in the screen to be taken to the next page. A confirmation will be asked from you, click on Confirm and then you will be taken to the Payment gateway. Choose the appropriate payment option to make the payment. Do follow traffic rules as you can be fined for a traffic violation captured by a camera. Do let us know your comments below and we will be happy to assist you.